Pinot noir grapes account for much of the blend giving this champagne great depth. A balanced, dry champagne. StorageStore in a cool dry place out of direct sunlight. Champagne is a regionally protected name for sparkling wine made in a specific region to specific techniques. 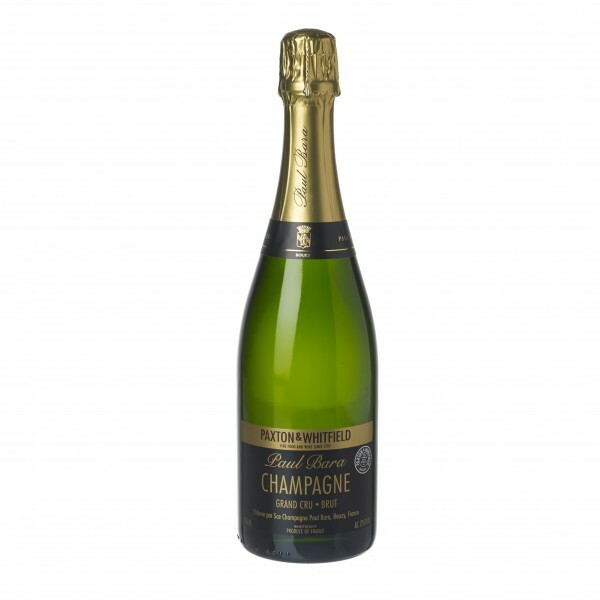 Most champagne seen on the shelves comes from one of the big ‘champagne houses’ (e.g. Moet, Lanson, Bollinger) who buy their grapes in from many producers and blend it to find a style they like. Ours comes from a small, family-run individual house called Paul Bara. There is a strict quality classification system in Champagne based on villages within the region that have been judged as better for producing wine based on a 1-100% scale: ‘Champagne’ might come from anywhere in the region. ‘Premier Cru’ Champagne must come from villages with scores of 90-99%. Paul Bara is allowed to use the name ‘Grand Cru’ as it comes from Bouzy, one of the 100% scoring villages! The main grape varieties used in champagne are Chardonnay, Pinot Noir and Pinot Meunier. The Chardonnay is thought to give the wine fruit and freshness while the Pinot grapes give depth and body to the wine. Our Champagne uses a high percentage of Pinot Noir, yielding a more full-bodied wine which is more capable of matching the full flavours of artisan cheese. Another key factor in the style of a Champagne is the way it is aged in the bottle with the yeast left inside. This is called ‘Lees Aging’ and the effect is that the wine takes on more savoury flavours from the yeast. This can be described as biscuit and bready by some. The minimum lees-aging time for most champagne is 15 months. Our Paul Bara Champagne is aged for a minimum of 3 years, the level typically used for ‘vintage’ champagnes. This gives more body to the wine and more potential for aging too.